Abundant Blessings: So You Want to Talk Grandmas? You probably have a wonderful grandma, a terrific grandma. But does she carry brass knuckles? Mine does and she just celebrated her 100th birthday. Okay, so her real birthday isn’t until next month but, here in Arizona, who wants to party in the middle of July? Hence, my mom set the party for the first weekend in June. Family and friends from all over arrived, some actually meeting for the first time. 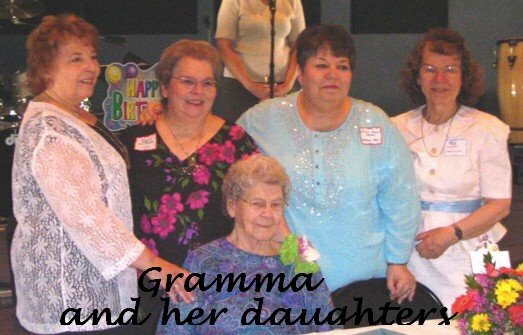 GrammaDear, as my girls call her, was surrounded by those she loves and those who love her. Getting to one hundred years of age has its burdens as well as perks. 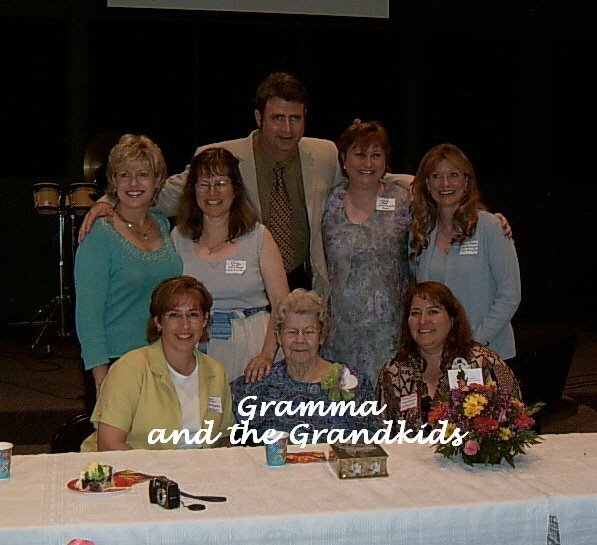 GrammaDear has out-lived one spouse, all her siblings, one grandson, and one great-grandson. 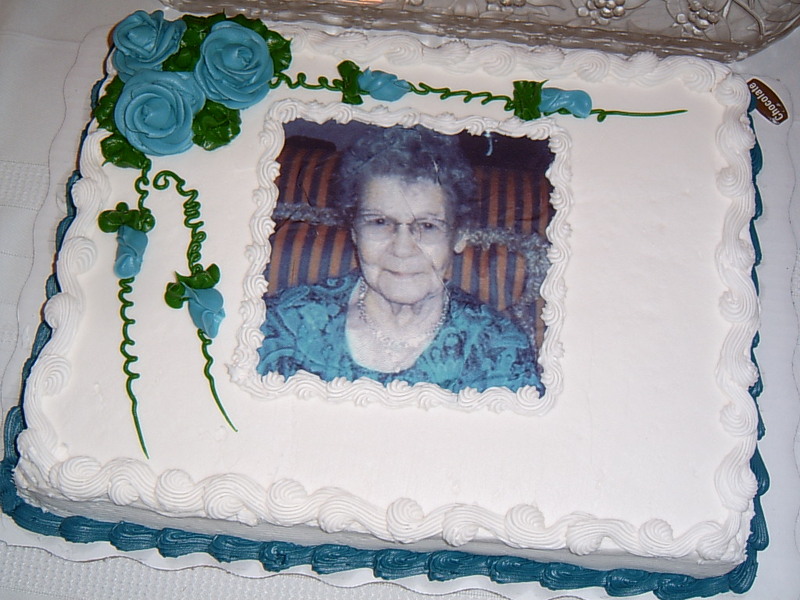 However, that only ensures a big celebration when she has her "Welcome to Eternity" party. They can keep planning awhile longer though, since we aren’t ready to say good-bye quite yet. 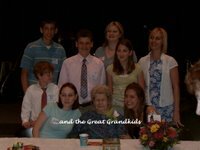 One thing became very apparent during our weekend celebration—GrammaDear has been a major influence on a lot of people, many who will never know her until they get to heaven. Here’s one tiny example: When my cousin Greg was a child, Gramma led him to the Lord. Greg, in turn, led a lovely young woman named Lynn to the Lord when they were both sixteen. A few years later, Greg and Lynn married and had two very beautiful daughters and Lynn led them to the Lord. Greg and Lynn’s daughters have both grown up and married godly men and are working in Christian ministries—Lindsay and her husband work with Young Life and Kristin and her husband are looking to leave for the foreign mission field, working with Campus Crusade. Imagine the number of lives they will touch all because one grandmother shared her heart with her grandson. and several of her great grandchildren. All of her daughters share her faith and the majority of the grandkids and great grandkids do as well. It is a testament to God’s promises for families. She carries brass knuckles and she’s one hundred years old, but that last part makes my grandma the best. The power of grandmas is amazing, isn't it? I think of how my grandma has influenced her whole family with her faith. I know she's one of the women I admire most. Glad you had a wonderful time and were able to post pictures. Very cool! Sometimes I wish I could have skipped parenting and went right to grandparenting. =) They get to do all the good stuff. And everybody loves them and thinks they're great. Unlike when my almost 7 year old looks at me and says, "Uh, nice hair, Mom." And then proceeds to crack up. Yeah...sigh. The grandparent gig looks kinda good. ;) Especially with a cool grammy like you have. I am your cousin from Illinois now living in Cleveland Ohio. My name is Rue Ann Freeland and I am the daughter of Kenneth and Janice Freeland. Kenneth is the son of Aunt Drenna's brother Donovan Troit (DT) Freeland & Rue Simpson Freeland. I just wanted to send you a quick note to say what a wonderful job you have done with your Blog and writings. This family has been truly blessed by Aunt Drenna and Uncle Leland and their beautiful children. When I was young Mary and Rusty lived accross the street from my Grandma and we would visit and play with Rusty when we came to stay with Grandma on the weekends. I was also the most fortunate of the DT / Rue Freeland Grands because while attending Eastern Il University I had the pleasure of acting as chauffeur or partner in crime with Grandma F., Aunt Gladys, Aunt Drenna, and Aunt Thelma, what a treat! The stories, conversations, trips to the cemetary's, and afternoons on the front poarch are memories I will treasure for the rest of my life. So Congrat's and Best Wishes to you and your family on this awesome undertaking. Please give my love to the rest of the clan. Jen, you are right about the power of grandmas--amazing! Sabrina, the best part of grandparenting (so I hear) is that you can spoil'm and have fun and then send them home. One of these days. Rue Ann, how nice to meet you, albeit in cyber space. 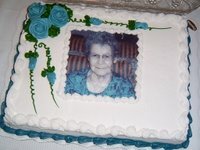 I noticed several pictures of your famiy among those in the huge slide show Mom and Aunt Yvonne put together. I'll bet you do have some stories to tell after chauffeuring those gals. We'll have to talk for sure. Thanks for dropping by my blog! Hi! Nice to hear from you Rue Ann! Just as a matter of clarification: It's "Derenna" - and her husband was Walter. Thelma & Lelon were a couple. It's so hard to keep all these relatives straight. I know! I tried to name them all on the Freeland Family Album, - almost 1,000 pictures on cd - a copy of which will be mailed soon to your folks. Please excuse any mistakes!